In 1984, the Baltimore Colts moved to Indianapolis, in part because Baltimore and Maryland officials refused to commit money for a replacement for Memorial Stadium. Not wanting to chance losing the Orioles—and Baltimore's status as a major-league city in its own right—city and state officials immediately set about building a new park in order to keep them in town. The master plan was designed by international design firm RTKL. The stadium design was completed by the architectural firm Populous (then HOK Sport), which had pioneered retro ballparks on the minor league level four years earlier with Pilot Field in Buffalo, New York. Populous' original design was very similar to the new Comiskey Park. However, at the urging of architectural consultant Janet Marie Smith, the Orioles turned it down, preferring a retro-style park. The ballpark opened on April 6, 1992 with the Orioles hosting the Cleveland Indians. The great success of Camden Yards which followed sparked a trend in the construction of more traditional, fan-friendly ballparks in downtown locations across the U.S. Indeed, by the 2012 season, all but two teams (the Toronto Blue Jays and Oakland Athletics) played in baseball-only parks. Many home run balls have landed on Eutaw Street, and the Orioles organization has marked the spots with small baseball-shaped bronze plaques embedded in the street, though it sometimes takes up to a year for each homer to get a plaque. The first home run to reach Eutaw Street was hit by Mickey Tettleton of the Detroit Tigers on April 20, 1992. The most recent home run to land on Eutaw Street was a shot by Pedro Álvarez of the Baltimore Orioles on September 2, 2016. As of September 12, 2013, 75 home runs have landed on Eutaw Street in stadium history. The June 29, 2012 game against the Cleveland Indians was only the second time multiple home runs have landed on Eutaw Street in a single game. The first occurrence was during the April 11, 1997 game against the Texas Rangers when Rafael Palmeiro hit two home runs which landed on Eutaw Street. The single season record for home runs landing on Eutaw Street is eight, set in 2008. September 6, 1995: Cal Ripken, Jr. broke Lou Gehrig's record of 2,130 consecutive games played, and hit a home run during that game. Attendees included President Bill Clinton, Vice President Al Gore, Joe DiMaggio, and Cal Ripken, Sr..
September 28, 2011: The Orioles defeated the Boston Red Sox in the final day of the season with a 4-3 walk-off win. The loss, coupled with the Tampa Bay Rays' 8-7 victory over the New York Yankees at Tropicana Field minutes later, eliminated the Red Sox from postseason contention. The Red Sox became the first team in baseball history to miss the postseason after leading by as many as nine games for a playoff spot entering the month of September. April 29, 2015: As a result of the 2015 Baltimore riots, the game against the White Sox was closed to the public. The game was played in an empty Camden Yards, marking the first known instance in MLB history that a game was closed to the public. Since its opening day in 1992, Camden Yards was a success and fan favorite. Attendance jumped from an average of 25,722 over the last 10 years of Memorial Stadium's tenure to an average of 43,490 over the first 10 years of Camden Yards' existence. Due to its success, many other cities built traditional-feeling asymmetrical ballparks with modern amenities (such as skyboxes) in a downtown setting. Many of these stadiums, like Camden Yards, incorporate "retro" features in the stadium exteriors as well as interiors; these parks have been dubbed "retro-classic" parks. Other parks, known as "retro-modern" parks, have combined "retro" interiors with more modern exterior elements. The park was originally the Centennial Olympic Stadium of the 1996 Summer Olympics. However, it was designed to convert into a smaller baseball-only park for the Braves. After the Olympics and Paralympics were complete, more than half the seats were removed (as originally planned), and the park reopened in its smaller form the next year. The newest MLB park, Marlins Park in Miami (opened in 2012), was the first since Camden Yards not classified as a "retro" park, whether of the classic or modern variety. Marlins owner Jeffrey Loria specifically rejected the retro model for the new park, desiring a facility that reflected the 21st-century culture of Miami. Populous, which designed both Camden Yards and Marlins Park, was willing to listen; the lead designer for Marlins Park would later say the company was "waiting for a client willing to break the [retro] mold." Stadium planners are labeling Marlins Park the first example of contemporary architecture in MLB. On the far side of the B&O Warehouse is the present Camden Station, served by both the Baltimore Light Rail and MARC commuter rail. The latter rail line provides direct service to Washington, D.C., and the former to BWI Airport. The Light Rail service began around the time the stadium opened. The stadium is located in downtown Baltimore, near the Inner Harbor. 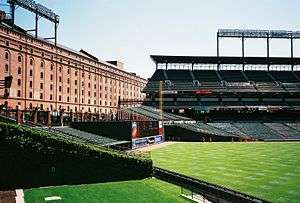 The ballpark, along with the adjacent M&T Bank Stadium, home of the Baltimore Ravens of the National Football League, make up the Camden Yards Sports Complex, though Camden Yards generally refers to only the baseball stadium. The football stadium was not built until 1998. Camden Yards is just a short walk from Babe Ruth's birthplace, which is now a museum. According to some sources, Ruth's father once owned a pub located in what is now center field of the stadium. A portion of an episode of the critically acclaimed HBO series The Wire, a show about police officers and drug dealers in Baltimore, was filmed during an actual Orioles game in which characters Jimmy McNulty and Bunk Moreland, played by Dominic West and Wendell Pierce, take their sons to a game while discussing a case. ↑ Waddell, Ray (March 30, 1992). "ARA Services to Offer 'New Trend' in Ballpark Fare at New Oriole Park". Amusement Business. Retrieved February 17, 2015. ↑ "Oriole Park at Camden Yards". Sports-venue.info. Retrieved January 22, 2013. ↑ "Orioles launch camdenyards20.com". Major League Baseball Advanced Media. June 19, 2012. Retrieved January 22, 2013. ↑ Pahigaian, Josh; O'Connell, Kevin (2004). The Ultimate Baseball Road Trip. Guilford, Connecticut: Lyons Press. ISBN 1-59228-159-1. ↑ Vanhooser, Cassandra M. "Inside Camden Yards." Southern Living. ↑ "Home of the Game: The Story of Camden Yards" by Thom Loverro (Taylor Publishing) ISBN 0-87833-222-7, p 57. 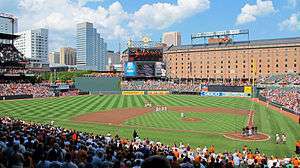 ↑ "Pope John Paul II gives Mass in Oriole Park at Camden Yards – Video". Catholic.org. August 29, 2010. Retrieved January 22, 2013. 1 2 "Orioles Legends Celebration Series". Major League Baseball Advanced Media. April 26, 2012. Retrieved January 22, 2013. ↑ Stewart, Wayne (May 1993). Mammoth Homers by Active Longball Hitters Recalled. Baseball Digest. Evanston, Illinois: Lakeside Publishing Company. Retrieved March 9, 2011. ↑ "Rockies hit 4 homers to extend Orioles' skid". ESPN. September 16, 2013. Retrieved September 16, 2013. ↑ Connolly, Dan (June 29, 2012). "The Year of the Eutaw Street Homer Continues". The Baltimore Sun. Retrieved June 30, 2012. 1 2 Gunts, Edward (April 21, 2008). "Going, Going, Gone". The Baltimore Sun. p. C1. ↑ Schmuck, Peter (July 17, 2008). "First Word". The Baltimore Sun. p. 3Z. ↑ "Retrosheet Boxscore: Texas Rangers 30, Baltimore Orioles 3 (1)". Retrosheet.org. August 22, 2007. Retrieved January 22, 2013. ↑ Biography of Susan Luery, the sculptor of the Babe Ruth statue. URL last accessed July 6, 2006. ↑ "TripAdvisor Announces America's Top Ten Ballparks". March 21, 2013. Retrieved February 28, 2016. ↑ Justice, Richard (April 3, 2012). "Richard Justice: Marlins Park a work of art in every facet | marlins.com: News". MLB Advanced Media, L.P. Retrieved June 18, 2012. ↑ Cahall, Aaron; Cannarsa, Andrew (May 13, 2008). "Losing O's Hurt Camden Yards". The Baltimore Examiner. p. 17. ↑ Comak, Amanda (August 19, 2008). "Oriole Park welcomes 50 millionth fan". Major League Baseball Advanced Media. Retrieved June 3, 2009. ↑ "The Hunt for Babe Ruth's Baltimore Beginnings". Chicago Tribune. February 11, 2014. Retrieved February 28, 2016.